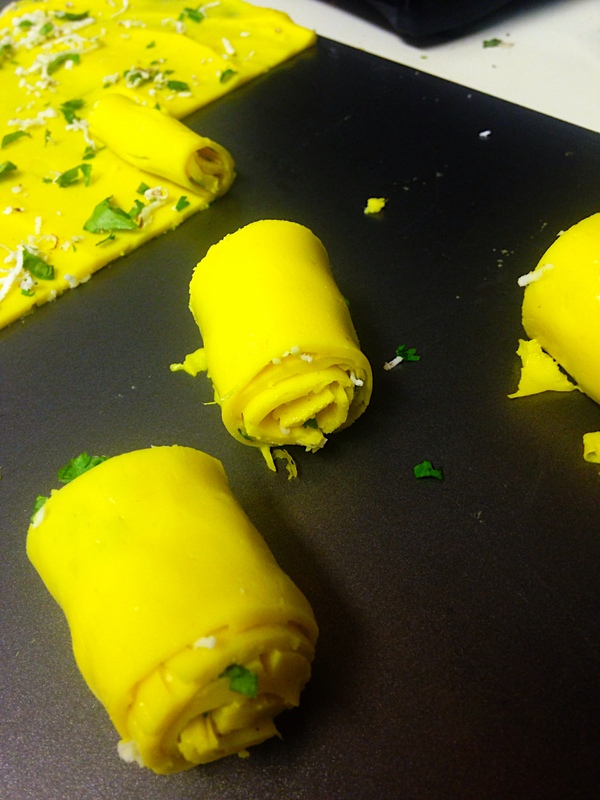 Khandvi (Gram Flour Noodle Snack) – One Half Indian. 1. Every stove/pot combo is different and cooking the khandvi on low was too low for me. The khandvi was not cooking. We eventually had to turn our stove up closer to medium. Okay. Here is my recipe and steps. I would definitely also reference Amit’s recipe because her photos are way more thorough than mine. I’m just not that dedicated. 1. Take the ginger and green chile and mash into a paste. I did this in a mortar and pestle but you could give it a quick zip in a processor as well. I was just nervous there was not enough ginger/chile for a blender or processor to be effective. smooth. 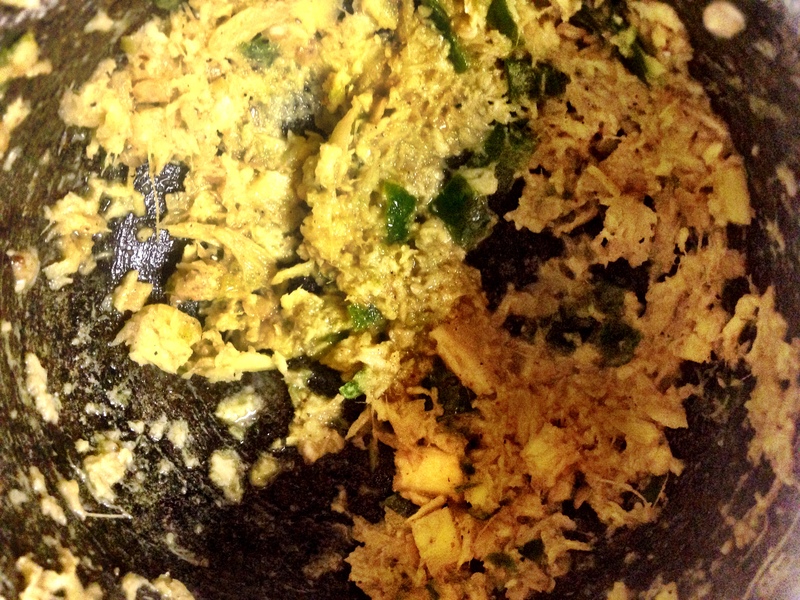 Add ginger/chile paste, turmeric, asafoetida, salt, and lemon juice. Add the besan/gram flour and whisk until smooth. All lumps should be dissolved. 3. Spread oil on the back of metal trays/plates/anything metal and flat. I used my aluminum baking trays. Indian households seem to have a lot more flat metal than American households, so you may need to be creative finding flat metal…like using aluminum. Hopefully you have more than one baking tray. I needed all three of mine: 1 large, 1 medium, 1 small. Set the pans aside. This is where the batter will set once it is cooked. 4. Prepare your filling. 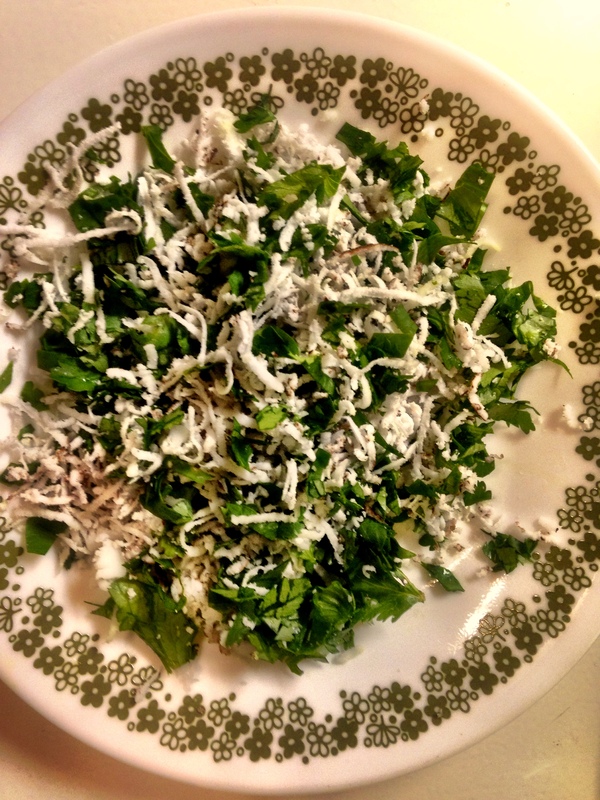 Chop the coriander and grate the coconut. 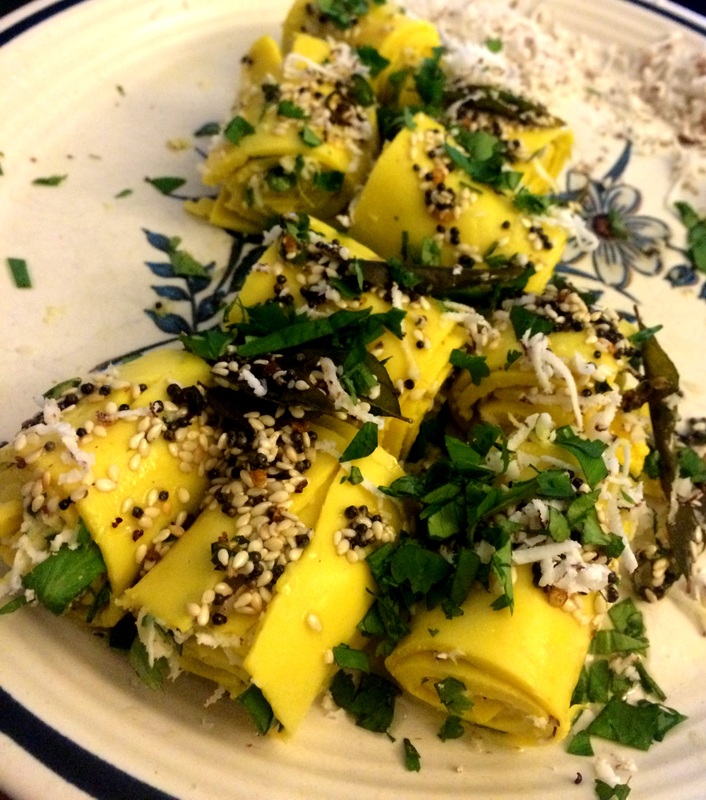 Set aside for once the khandvi is cooked and set. 5. Put the batter in a sauce pan or broad frying pan on the stove. Put the heat between low and medium. If you use a broad frying pan, your khandvi batter will likely need a bit less heat and cook faster since more of the batter is in contact with the hot cooking surface. 6. 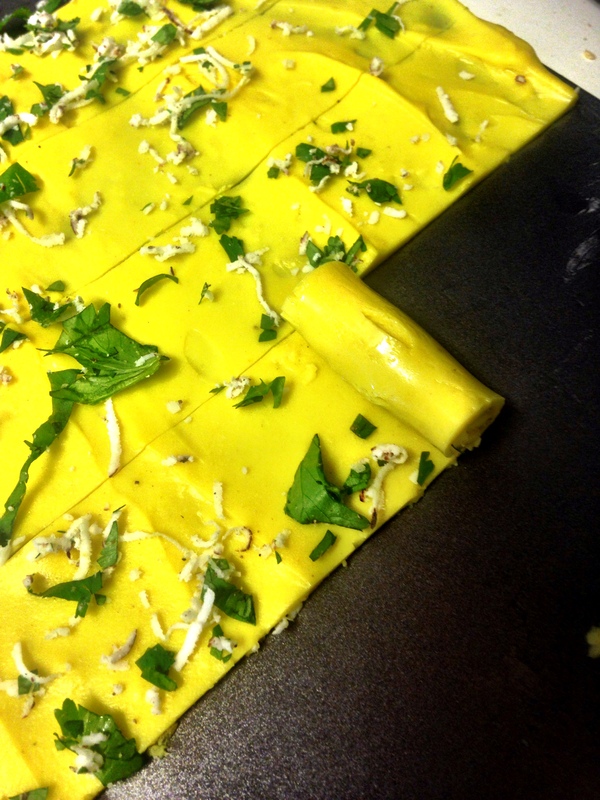 Stir the batter continuously as the khandvi cooks. Lumps will form in the batter and you need to keep stirring in order to avoid the lumps. Early on though, I did leave my just sitting for 30 seconds or so at a time to help it heat up some. 7. 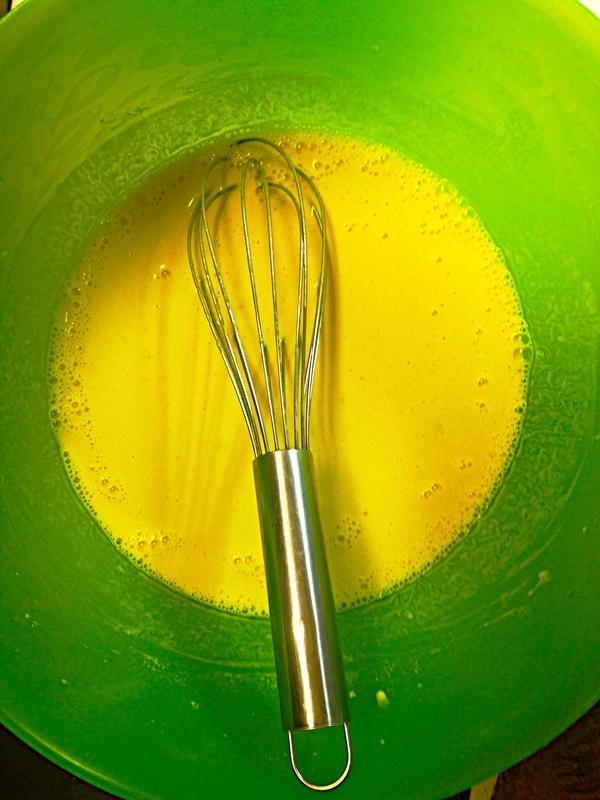 The batter will thicken and keep thickening. You keep stirring. 8. Keep stirring. Keep thickening. 9. When the batter has thickened well, do a plate test with a tbsp of your batter. If the batter is not setting then it needs longer. The batter should set into a noodle like consistency and be able to roll up off the pan. 11. Pour the batter on the greased pans. I poured about 3/4 cup on the large pan, 2/3 cup on the medium pan, about 1/2 cup on the small pan…ish. Spread the mixture out with a spatula. Go quickly so that the batter does not become a cooled blob, but also breath and spread evenly as best as you can. If your batter does become thick and difficult to spread, still use it. It will taste good, but the rolls will be thick. Basically, go fast, but not too fast. And stay calm. 12. Let the mixture cool (about 10 mins). Spread the coriander/coconut mixture sparingly. I saved a bit to put on top as well. 13. Cut the cooled batter into even strips. Pull up the end of the strip and begin to roll tightly. 1. Heat the oil. Add the mustard seeds and let them crack. 2. Add the curry and green chiles and fry for a few seconds. Take off the heat at this point. 3. Add the sesame seeds. Let the mixture marry for a minute off the heat. 4. 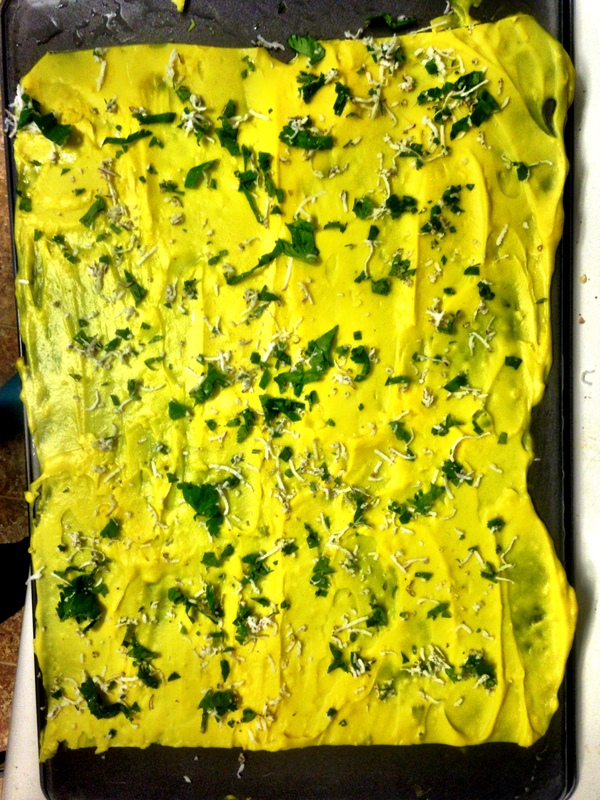 Pour the mixture evenly on top of the rolled khandvi. 5. Garnish with leftover coriander and coconut.